HEICO SPORTIV, the internationally recognized Volvo tuner, presents its Volvo creations prior to the official market introduction. 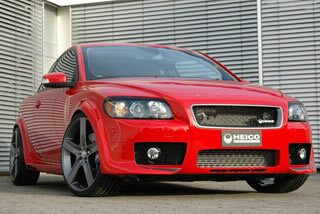 One of the stars at SEMA Show in Las Vegas (early November): the all-wheel-drive life-style creation, the C30-based HEICO HS3 THOR. For a strong drive a modified 2,5 litre 5-cylinder engine with 250 hp (220 hp stock) and 360 Nm torque (320 Nm stock) is installed. In addition to this engine type, HEICO SPORTIV already offers ECU-upgrades for the 2.0D and D5 diesel engines. 250 hp and 360 Nm torque serve as appropriate propulsion, and the 4-piston sport brake for safe deceleration. On top of this, the technicians from HEICO SPORTIV have developed a special setup for the C70 suspension kit, with great importance placed on maintaining similar driveability whether driving top up or top down.